Laurel, Mississippi is a small city of about 20,000 residents located in the southeastern part of the state, with about 80,000 in the immediate micropolitan area. A considerable distance from other large cities in the south, Laurel is located along the I-59 corridor about 140 miles north of New Orleans and 200 miles southwest of Birmingham. The city is known for oil, manufacturing and agricultural-related endeavors, and is a quintessential example of the old-fashioned deep south. Laurel’s relative distance from other cities requires a substantial retail presence in town. The nearest larger city is Hattiesburg, Mississippi, with a population of about 40,000. Hattiesburg is about thirty miles south of Laurel on I-59 and is home to a large regional mall called The Mall at Turtle Creek, and a huge retail strip. 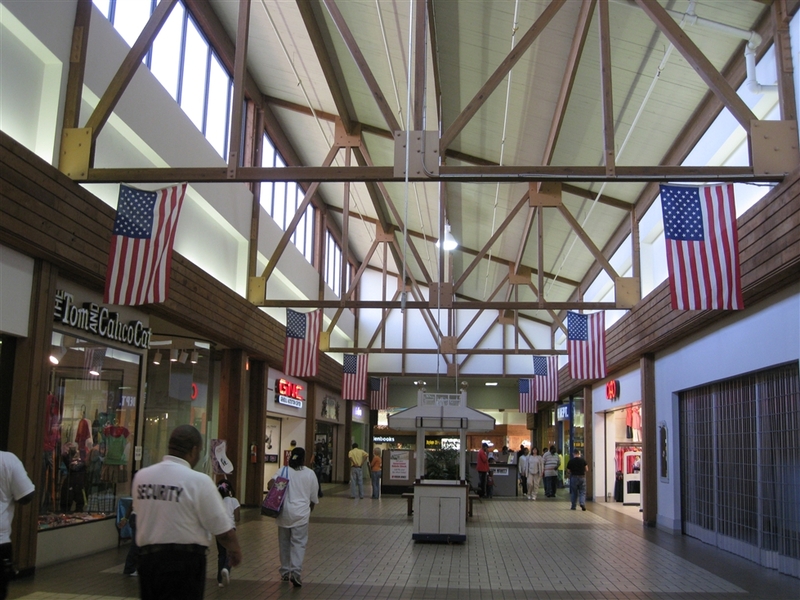 Built in 1995, The Mall at Turtle Creek draws shoppers from all over southeast Mississippi and is the most substantial mall in the entire region. It even replaced an older enclosed mall, the Cloverleaf Mall, on the other side of Hattiesburg which has recently repurposed itself into a mixed-use office/retail complex. But Laurel does indeed have a mall. Sawmill Square Mall opened on the site of a former sawmill (who’d have guessed?) sometime in the 1970s. The mall is anchored by Belk, JCPenney, and a huge pile of logs. Just kidding about that last one. 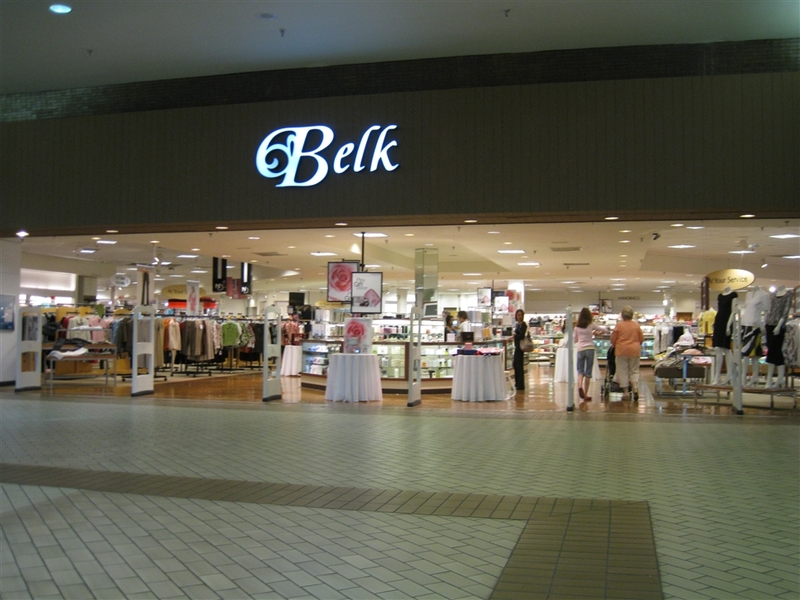 The Belk was recently a mid-range department store from Jackson, Miss. called McRae’s, and got eaten up by Belk in March 2006. You can sort of see some of the McRae’ labelscar on the Belk photo above. 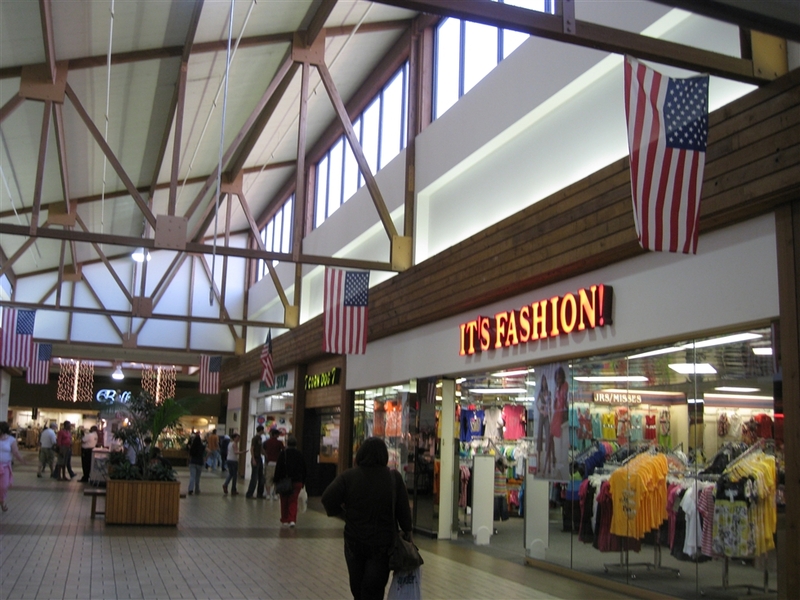 The decor of Sawmill Square is sort of modeled after a sawmill, or at least what people in the 1970s thought a sawmill would look like if it was turned into a mall. And this was apparently the case, as one of Laurel’s largest sawmills once stood on the site. We’re not sure what, if any, of the original mill still stands in the current mall structure though. There are lots of exposed beams and latticework, with dark tiling and wooden facades everywhere. The mall obviously hasn’t received a major update in its lifespan, a rare find these days. The selection of stores at Sawmill Square seems adequate enough for a city its size, but locals apparently disagree. I wouldn’t exactly call this a dead mall per se, as it seemed mostly leased with at least a decent amount of national retailers. It was also packed on the Saturday evening I visited. But on the other hand, I kind of see their point; many local stores inhabit the mall, (some of my favorites are in the photos) and several national retailers have relocated to a “newer” strip near a Wal-Mart Supercenter and Lowes and just ignore the mall completely. Even so, the mall’s pretty substantial, and although a renovation of the mall would kill its awesome 1970s decor and vintage character, it would probably lure even more shoppers and retailers alike. Take a look at these pictures from March 2008 and let us know what you think. If you can provide more information about the mall, that would be great too. When exactly did it open? Also, if you’re familiar with the mall be sure to leave some of your own personal stories and anecdotes. What an interesting mall! I kind of wish the saw mill was still there, as it would have made such a cool addition. Love the logo, as well as the separate Belk Juniors store. Great find! I actually thought this mall was torn down years ago. See, the DeadMalls.com report is rather grim and the website went down several years ago, and the new owners have placed a lovely robots.txt in the source. However, I *might* have a copy of the floorplan kicking around on my hard drive, so I’ll try to get back to you. It’s a lovely wood-trimmed 70s mall! 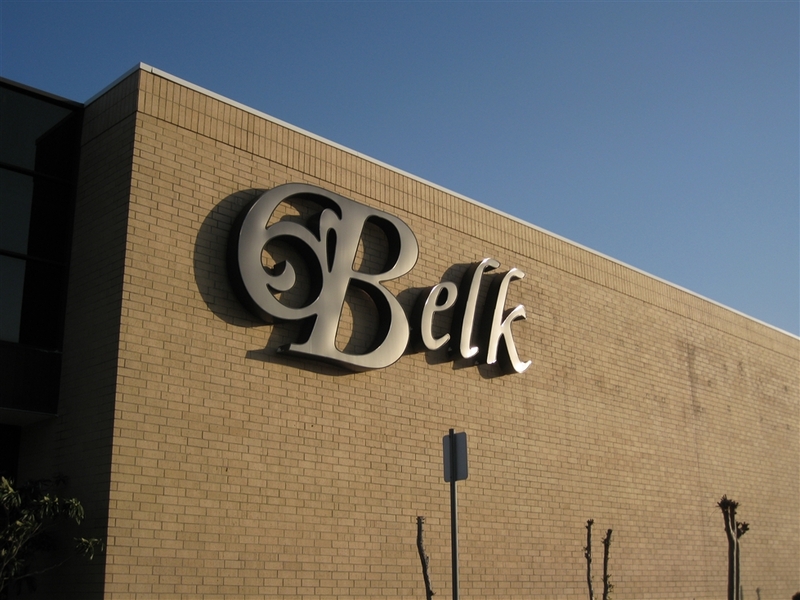 Ah yes, the seperate Belk juniors department: It would have been better if Belk energized the ambience and design of this space with that of its nearby fashion retailer competitors (Limited Too, Charlotte Ruse). Renaming it ‘Z-Universe’ would even take the concept a step further. Those blank white walls could be transformed into showcase displays. @Nitek Ketin, That Juniors store was originally a children’s shop and painted powder blue. Belk no longer has the space open as an extension of the store anymore. Yeah, one of the issues with the Deadmalls site is that there’s no real way to gauge how ‘dead’ a property is. Often they can’t feature pictures with each posting, and have to rely solely upon the discretion of those who write their submissions to tell us about the property. So you can probably guess that some people will call something ‘dead’ when it’s really still perfectly viable, just as the case here. I mean, the mall isn’t great, but it’s holding its own. Dead? Nah. The mall has its vacant spots and some of what I would call ‘local’ shops, but overall it looks to be doing a decent job of staying viable. You don’t see malls all too often anymore with a vintage-1970s appearance that are still filled like this one is. Love the entryways too…..dark wood paneling and that bright retro-looking “sawgrass square” signage. They don’t bulid ’em like this anymore. our mall here has brand new shops now to like rue 21 and the taco place and the monogramming place. its actually a really good mall! i love it! Especially that taco place!~ YUM!!! Sawmill Square actually was opened in the early 80s. It’s never been remodeled though. Thanks for the article. I was impressed by this mall, even though it is seriously outdated. I was sent there two years ago by my employer to decide on a location. I decided to pick the Turtle Creek Mall instead. BTW, its Turtle Creek Mall, not Mall at Turtle Creek. Turtle Creek Mall is in Hattiesburg. Mall at Turtle Creek is in Jonesboro, AR. And speak of the devil Jonah, I noticed the robots.txt in the source of Sawmill Square’s old website too, when I was randomly looking at certain mall entries on Deadmalls a few days back, and then attempted to look up the old site for this mall on Web Archive(.org). *sigh* Regardless, I hope you are able to locate the floorplan for this mall and email it to Labelscar, if you luck out and find it. Finally, I’ll ‘fess(interesting enough) something I suspected about the Belk exterior pics(least before I realized this location was a former McRae’s) that when I first noticed the labelscar around the Belk logo, I thought it was one of those former hyphened/dual-named Belk stores(a la Belk-Lindsey, Belk-Rhodes, etc.). Honest first (but wrong) impression I had…. Anyway, that thought aside, was this mall built from remaining buildings that stood from the days the site was a sawmill, or was the mall just built to evoke the feel of a sawmill building? Maybe somebody knowledgeable enough about the history of this particular mall can answer my question. Finally, don’t think I need to mention how much I love the logo this mall currently uses. While Deadmalls.com isn’t 100% accurate, I still find it interesting. 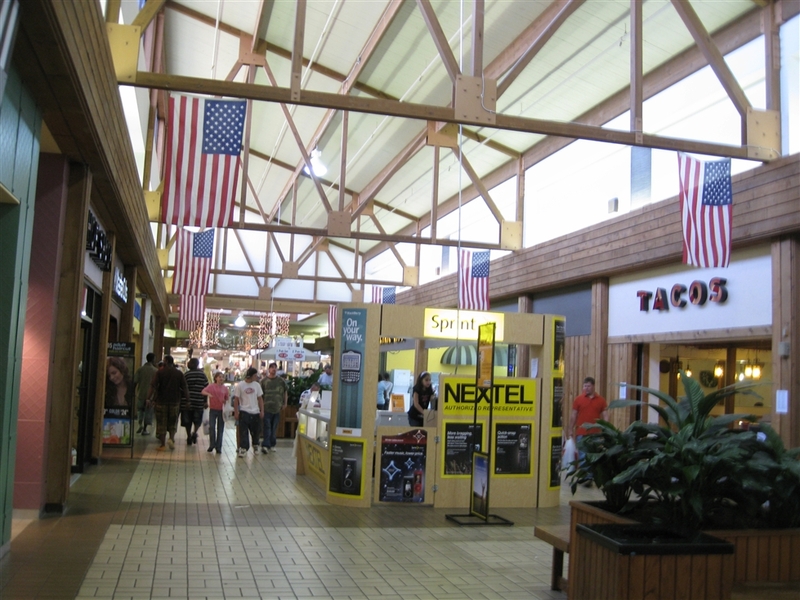 As a contributor there, I try to be as factual as possible, but it can be hard, what with the limited info out there, especially on now-defunct malls, and the smaller shopping centers that only held, say….two anchors and a dozen or so shops. I still think it’s a good resource, chronicling malls that were once vibrant and have since shuttered, or those malls that thrived, died, then rose from the dead through reuse of the building / land to become viable again. It really kickstarted the whole ‘deadmall’ thing for a lot of folks now into it like myself. Yeah, I don’t disagree with you there about deadmalls.com. Obviously, I love that site(as I do other dead mall sites/blogs), but sometimes the entries about those malls(and the info about the malls they mention) are limited. But OTOH, I also know that’s just the way people’s recollections on malls are often like, considering how often malls go through changes and renovations during their long periods(and often decades) of operation. Sawgrass Mill was originally owned by Mills Corporation, a real estate company. Last year Mills Corporation went bankrupt and their entire portfolio of 12-15 malls was bought by Simon Property Group in partnershipp Farallon Capital. Just wait for sometime, Simon will turn around this mall and make it a very successful & relevant destination. Cheers. It’s interesting to see so many non-chain stores (Electric City, for example). It’s kind of the 60s/70s ideal of what the mall would be–an indoor downtown (a wretched ideal, to be sure). 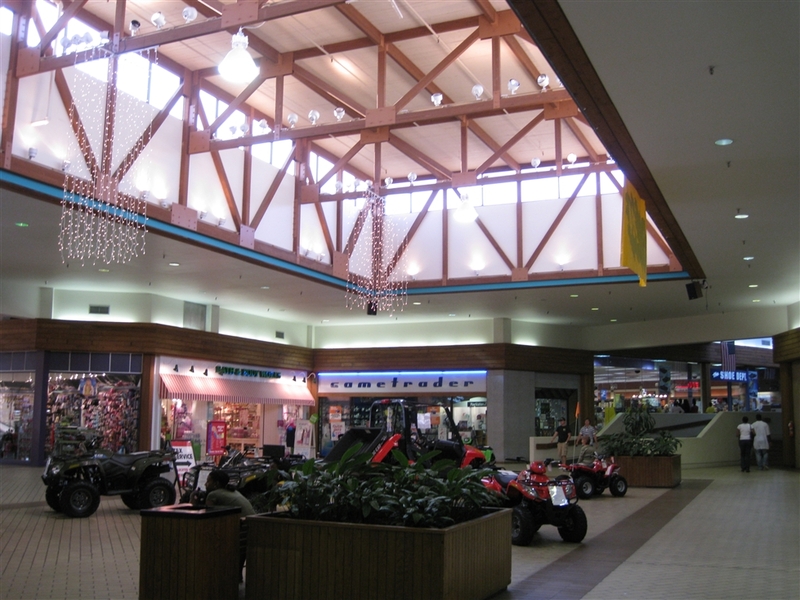 This isn’t the mega-successful and huge Sawgrass Mills Mall in metro Ft. Lauderdale, FL; it’s the Sawmill Square Mall in rural Mississippi. I’m sure Electric City would go the way of the dinosaur if Circuit City or Best Buy ever showed up in this town. Electric City was a chain of stores in Mississippi that I believe were started by the Mississippi Power Corporation. They were were purchased by another local chain called Cowboy Maloney in the 90s and now operate as Cowboy Maloney’s Electric City. Most are off mall strip center stores though. I think that “Electric City” is Cowboy Maloney’s Electric City. They’re pretty popular in Mississippi (multiple locations throughout the state), but I know Best Buy and Circuit City have been quite successful in encroaching on them in Jackson and Hattiesburg. @leoninatl, Electric City is Cowboy Maloney’s. I live in Monroe, LA and I worked for a local Monroe electonics/appl. retailer (Basic-Your Best Buy) that competed with them online and would ship to Jackson and surrounding areas. It should be noted, that lots of malls back in the day had a more eclectic mix of local / regional, along with national tenants. This includes anchor stores. The trend of filling malls with only national tenants really didn’t take hold until the 1970s and 1980s. I’m noticing a reversal back to the days when malls had the local / national mix, as mall landlords are having a more difficult time getting national tenants to fill in vacancies. The difference between then and now though, is striking. Like with this mall, the locals/regionals all have put effort into their store designs and….’gasp’ actually paid the few thousand to put up a lighted channel sign above their storefronts. Nowadays you see local stores and you can tell they’re local. Using existing store fixtures and decor, and just sticking a tacky plastic or wood sign above the entrance…..sometimes just a mere banner. To me that screams ‘cheap’ and ‘tacky’. Best Buy’s already penetrated the big cities. Now they’re going after the small ones with their smaller format stores of 25,000-30,000 sq ft. If they move into this town, that ‘Electric City’ is as good as gone. “Electric City” has always been a ripoff and sold crap products to me, so when I lived in Mississippi, and Best Buy moved into town, I was more than happy to patronize them instead of the other. Visited this Mall 1 time in May 1985 1 week after my high school graduation. Had a friend that lived in Laurel at the time and spent a week with her just to get away for a short while. I still remember the decor, I thought it was so cool. Some stores I remember that I am pretty sure are long gone were the Record Bar, bought and Iron Maiden album (vinyl) there along with a couple of pins for my jacket. There was I seem to remember a Pizza By The Slice, cannot remember if it was Sbarros, Stuarts and Brooks Fashions were a couple of other stores I remember. There was also a Wild Pair and Shoe Town. I sure do miss the 80’s and 90’s. A lot of the stores I liked are no more. I think the the Taco Shop is where the Brooks Fashions was. It almost looks like an old Brooks Storefront. @Margaret Duhon, That actually was the Taco Casa. It opened when the mall did. When they pulled out, the new owners just took the CASA part of the sign. I live in Laurel. This mall was built in 1981. The Taco Place is an original tenant. This mall used to have the Kay Bee toys, etc etc etc It still has a Radio Shack, Shoe Dept., JCPenney, and other national chains. That Taco place is actually very good… never would want Taco Bell again! (Not saying Taco Bell is that great.) Cowboy Maloney’s Electric City is a big regional chain. 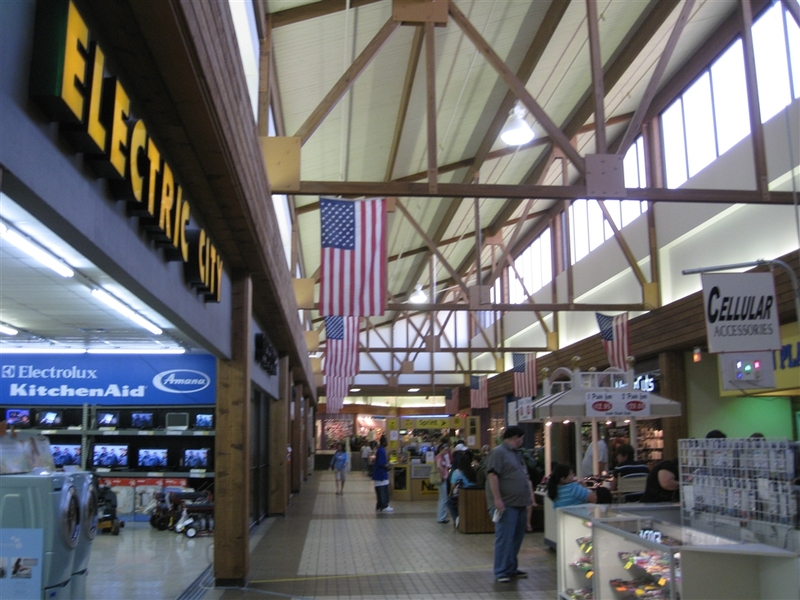 The Sawmill Square Mall store used to be just Electric City, a smaller chain, that was purchased by Cowboy Maloney out of Jackson. Don’t pay too much attention to that logo. It’s old, and the mall does have a new one. I am surprised the photos don’t show… there’s a new state of the art sign with a new logo and the electronic full color message board like a small Jumbo Trom at stadiums… very nice. I’ve heard the mall will be remodeled inside and outside to go along with that new image. Laurel hasn’t grown much because of the boom of Hattiesburg. (It’s a college town with two universities, and only an hour from New Orleans, Mobile, and the casinos of the Gulf Coast). Laurel is getting its share now, however, with the Lowe’s a couple of years ago, new restaurants, new neighborhoods, etc. How old is that Belk/McRaes? Here is is suggested that it dates back to the opening of the mall, but it has a textbook Proffitt’s/McRaes exterior design from the late 80’s. Could be a renovation job, but I thought I’d ask. McRae’s was original to the mall. The local newspaper ran a story about Sawmill Square a couple of weeks ago. It has a dozen of so placed open that are original… Corn Dog 7, Chic-Fil-A, McRae’s (Belk), JCPenney, and some others. Can’t remember. I know that this is way off-topic, but whatever happened to the April Fool’s Day post on “Hometown Mall”? This article just simply vanished. This mall is awesome. These smalltown malls are my favorite kind of malls. I remember very vividly the deadmalls.com entry on this mall that painted a very dim picture of this mall. I was so surprised to see it pop up here. It is good to see it is not so bad, just because a mall loses a few of the bigger chain stores, does not necessarily mean it cannot continue as a successful retail destination. It’s vintage look reminds of me Singing River Mall in Gautier, MS, except that Singing River is more of a dead mall. It was almost empty when I was there last summer, unlike Sawmill Square which is almost fully leased, with a decent tenant mix. 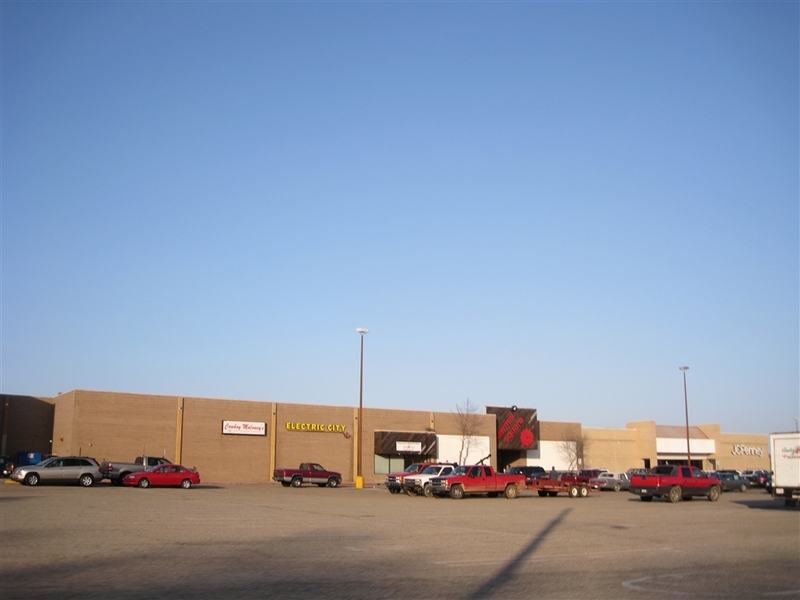 The write up on deadmalls.com would more closely describe Singing River Mall, than Sawmill Square. I like the sawmill inspired theme and design with the dark brown beams above the corriders, the dated look is the thing that so charming. Some of the pictures look like vintage mall photos that was taken 20 years ago, rather than pictures taken last month! The floor looks a little more modern than rest of the mall, could have possibly been replaced in the late 80’a or early 90’s. And that main entrance with the image of the red blade over the dark brown wood, you certainly don’t forget it is a sawmill inspired theme for the mall when you see that entrance. I was pleasently surprised to see it still had many stores that typically are located in a smaller mall, like Shoe Dept, Payless Shoe Source, Bath And Body Works, GNC, Corn Dog 7, and Cato, as well as the music store Sound Shop, which still has many stores in smaller malls in the southeast, and a Waldenbooks, which also still has stores in many smaller, older malls too. Singing River Mall still had Waldenbooks and Sound Shop when I was last there. But the local stores are really cool, Electric City is my favortie, it sounds so 70’s(LOL!). They really help add to the vintage atmosphere of the mall. However, I do agree with Prangeway that an update of the mall probably would help them attract some younger,hipper stores. Something that most of us would not want to see change, but maybe something needed to keep this small mall open with the lifestyle/big box center craze causing the closing of many of these smaller malls. I am sure the vintage early 80’s look of the mall has kept some stores from locating in the mall. But it looked like a lot of people were in the mall when these photos were shot. McRae’s was not a mid-range department store until it’s last year or two in existence, it was closer to what Dillard’s and Macy’s is now. Saks Inc downgraded the stores in it’s last few years as more of a mid range department store right before they sold the stores to Belk. This could have been a last effort to see if the stores would be viable for the company to keep. But maybe you are calling it mid-range store like Dillard’s and Macy’s?, since they are not a very high end stores like Nordstrum’s, Neimen Marcus or Saks Fifth Avenue. McRae’s was a little higher end than say, JCPenney or Kohl’s at one time. 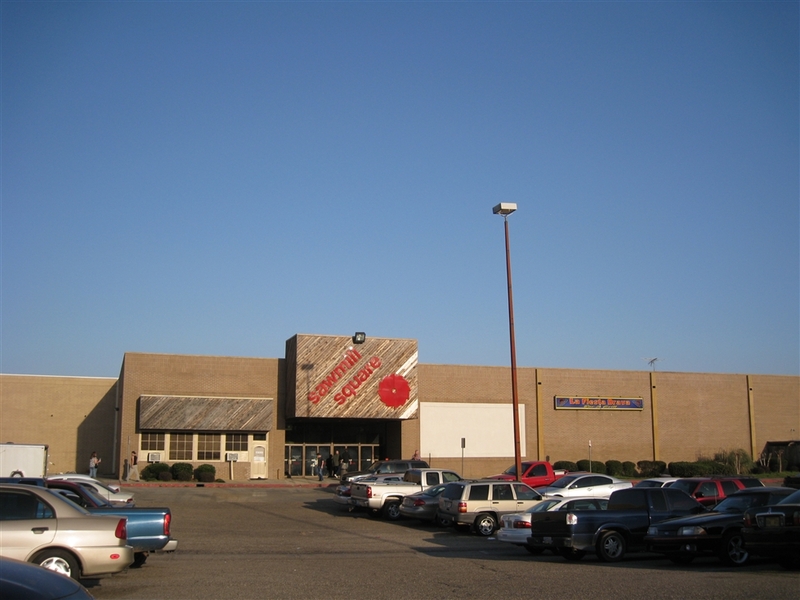 When the Mall of Louisiana store in Baton Rouge first opened in 1997, it was basically a clone of Dillards and the then Maison Blanche(formerly Parisian, then Foleys,now Macy’s) also in the mall, and had a lot of the same brands. But around 2003 or 2004 the Polo Ralph Lauren men’s store had been replaced with the Chaps Ralph Lauren brand. I assume this was done to all stores chain wide. Since McRae’s was originally founded in Jackson, most malls in Mississippi had a McRae’s store. Laurel’s micropolitan population is more than big enough to support a mall. However, there is also another larger city about the same size as Hattiesburg, called Meridian(population around 40,000) which is a little further away, around 55 miles north of Laurel on I-59 where it connects with I-20, that has Bonita Lakes Mall. 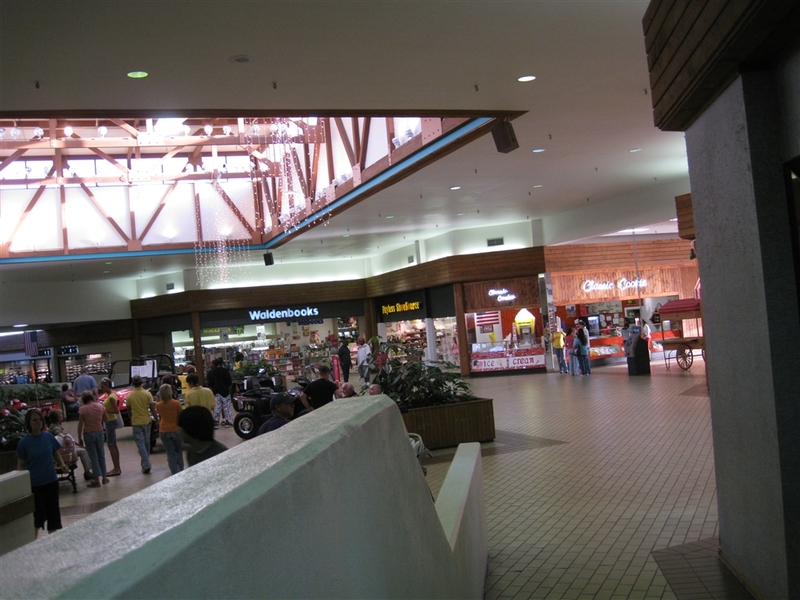 Bonita Lakes Mall was opened in 1997 and replaced an older smaller mall, Village Fair Mall, kind of like what happened in Hattiesburg with Turtle Creek Mall replacing Cloverleaf Mall. 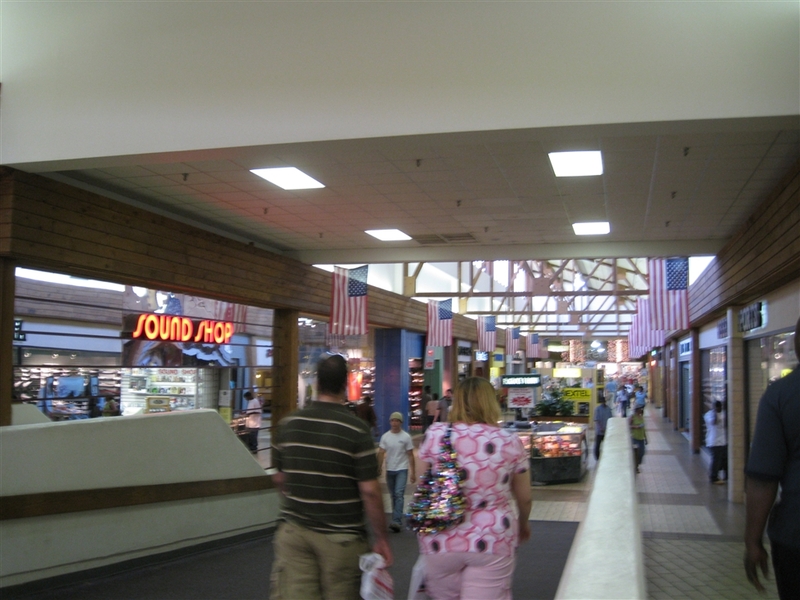 It is more of a “big city” mall with similar stores to Turtle Creek Mall, and has 5 anchors, and could also contributed to the choice of some retailers not choosing to locate a store in Sawmill Square. 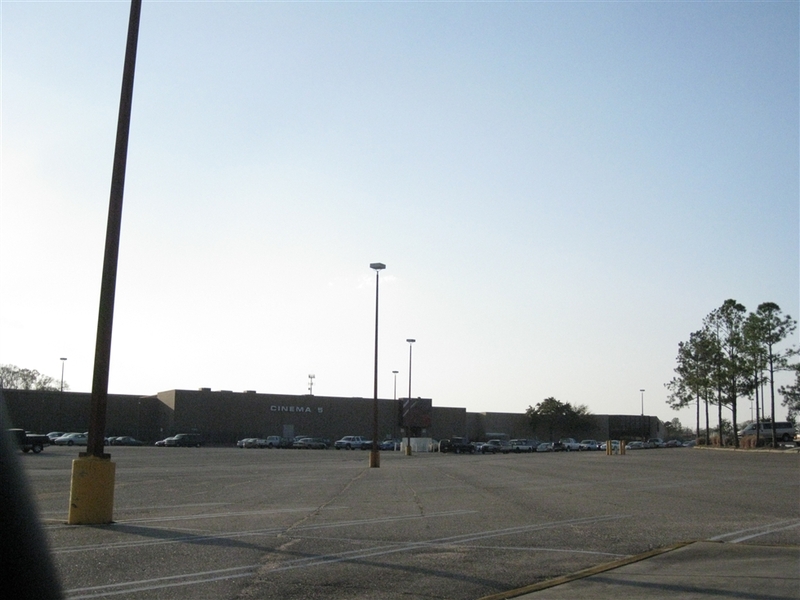 Both Bonita Lakes and Turtle Creek are owned by CBL Properties, I thought CBL Properties might have owned or managed Sawmill Square, but that is Pemberton Square Mall in Vicksburg, MS that CBL properties also owns that I was thinking of. The next closest cities to Laurel in Mississippi that have malls are in the Gulfport/Biloxi area and the Jackson/Ridgeland/Flowood area, but all these cities are a far enough distance to keep a mall viable in Laurel. This wasn’t done chain-wide. Proffitt’s/McRaes took a Belk-like approach to their stores in 2003 and created two levels of store, based on sales in certain areas of the store, also taking the local demographics into account. The lowest half or so in sales had Tommy Hilfiger and Polo replaced with RBM and Chaps. They also eliminated nested suits in these stores, replacing them with seperates. The women’s departments were changed as well, but obviously I have less expertise in that area. Another factor that determined the merchandise mix in some stores in Mississippi and Alabama was the other anchors in the mall, particulrily if there was also a Saks-owned Parisian in the mall. In Tuscaloosa, for example, the McRae’s lost its Polo department, but Saks upgraded the one across the mall at the Parisian, Intrestingly enough, that store was not a part of the first Belk purchase, as Saks made the McRae’s into a Parisian men’s store. They both became Belk after the second purchase. Thanks for the info Brian. I always thought the entire McRae’s division was an upscale department store like Dillard’s or Maison Blanche until the day I walked in and saw the Polo sign gone and the Chaps name in it’s place. There was even the polo labelscar on the wall inside the store next to the chaps label sign. Also, the Baton Rouge store was the only McRae’s store I have ever been too as well. But I thought that there was a possibility that they did not make this conversion to lower end brands at all stores and done as you said, just in markets that already had similiar stores, like there own division Parisian or Dillards, in the same mall or at other malls in the same city. And Baton Rouge’s other mall, the 31 year old Cortana Mall, has a Dillards and at the time a Foley’s(now Macy’s) as well. So with 2 Dillard’s and 2 Foley’s in town, it probably was sensible to try to make the 1 McRae’s in town a more middle end store option for shoppers. 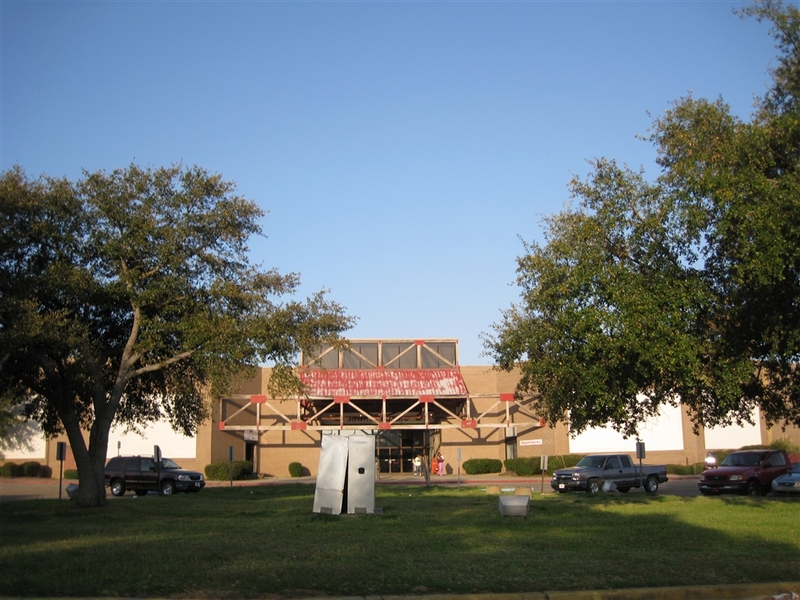 McRae’s had one other store in Louisiana at Pecanland Mall in Monroe in north Louisiana. I have never been there so I would not know if that store was changed. But Monroe is a much smaller than Baton Rouge. Pecanland Mall is the only mall in Monroe and has a Dillard’s, Sears, JCPenney and Mervyn’s(now closed), so they may have kept the higher end format at that store until it converted to Belk. The next closest cities with McRae’s was in Natchez, MS at Natchez Mall and in Biloxi, MS at Edgewater Mall. 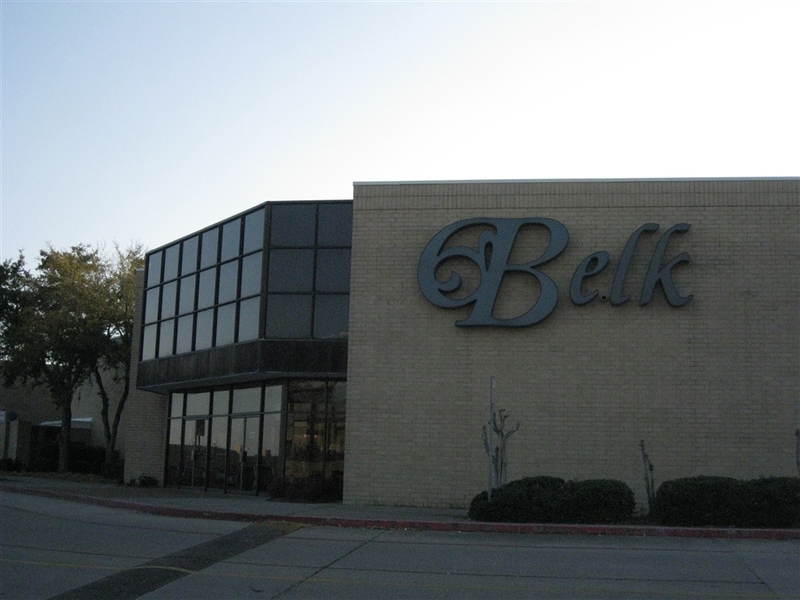 The McRae’s store in Mall of Louisiana was not converted to Belk. When the mall was opened in 1997, Dillard’s had made an agreement with Saks Inc that if they ever decided to pull out of the mall or sell the chain, that they would purchase the anchor and have dual anchor format at the mall. Now the former McRae’s is the Dillard’s men’s, children’s and home store, with a furniture department on the 2nd floor. And the original Dillard’s is women’s and jewelry store. So Baton Rouge has no Belk, but almost got a Belk through the Parisian acquisitions in the just recently opened Perkins Rowe develeopment. I remember eating at the Corn Dog 7 at the Rock Hill Galleria in Rock Hill, SC as a kid…it was an original tenant and only stayed 2-3 years. They had the BEST corn dogs…we loved eating there. I had no idea it was a national chain! This mall is amazing! I wish I could visit it. The orange-red logo on the exterior evokes all kinds of nostalgia in me and I’ve never even been to the place before. The very best thing about this mall is the Corn Dog 7. The only other location that I know of is in Columbus, MS (150 miles away) at their defunct mall. I live in Hattiesburg, MS which is over 30 miles away and has its own mall and I still drive to Laurel to get the best hand dipped corndog and fresh squeezed lemonade ever made by human hands. All should try at least once before death. I was disappointed when I went to my local mall to find that MY local Corn Dog 7 closed. I never went there! Wah! There was Corn Dog 7 in the now demolished Hammond Square Mall. It was opened until the week before the mall closed. The website for Mall St. Vincent in Shreveport list an eatery named Corn Dog Plus. This may be the same as the Corn Dog 7 because this is an old 70’s mall with no food court, but I am not sure. I never went to Corn Dog 7 in Hammond Square that I could remember. Now I wish I would have went to it darn! OK. The second best thing about Sawmill Square Mall in Laurel is that it has a bar in the Mexican Restaurant. Not the taco joint but the full service restaurant. They have live bands on the weekends. I’ve been there on several occasions drunk off my ***. They keep that section of the mall open on the weekends til late/early in the morning. Very unusual for the Bible Belt. This mall is far from dead. Outdated, in need of a facelift, YES. Dead? ?……Gimme a break. You all should make a trip of it and get toasted one weekend! Thanks for the info Shawn S. A vintage mall with cool architecture, good corn dogs, and mexican food and music on the weekends. Sounds like a great place to be. I am gonna have to make a trip to Laurel now!! Can anyone upload a directory picture? I tried that Deadmalls link and has nothing to do with the mall. Who owns the mall? Anyone knows? Well, the link went dead and it was bought up by a Robots.txt-placing entity that unfortunately makes it impossible to search backwards via Archive.org. I might have a JPG of it lying around, but the floorplan is basically a “crimped dumbbell” (think many early Pyramid malls) with a vague “V” shape. Penney’s and Belk anchor opposite ends. I grew up in Laurel. This mall is not from the 1970’s; it was built in 1981. It has certainly faded from the fun place it was in my youth. That link has a map & such. From what i’ve been told, it is on the site of the old sawmill’s pond, not the actual mill, and there are some remaining buildings formerly used for drying large timbers off to one side. I live in Laurel. 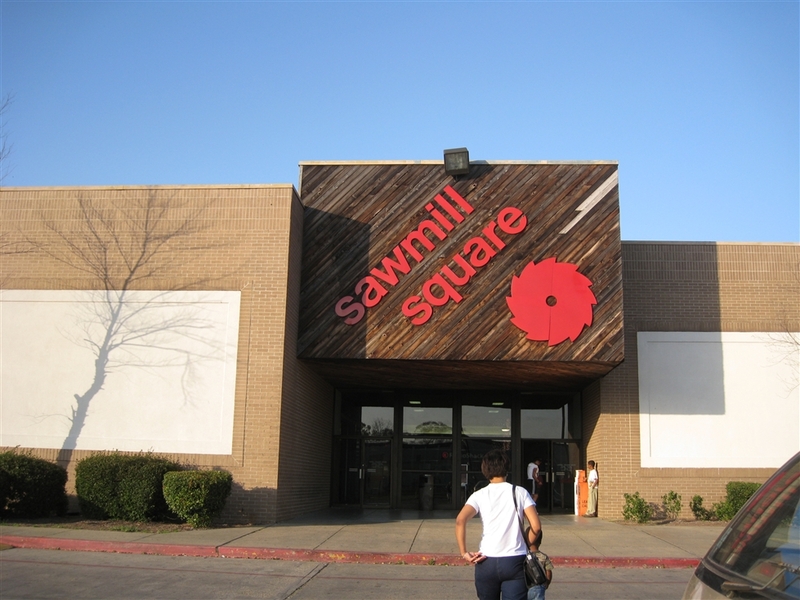 The “Sawmill Square Mall” has gradually gone down hill. the salvage store. The mall itself is very out of date. It is not a safe place to go at night or the weekend nights shopping anymore. Sad but true. Wish they could renovate and move in some decent stores. I grew up and currently live in Laurel. 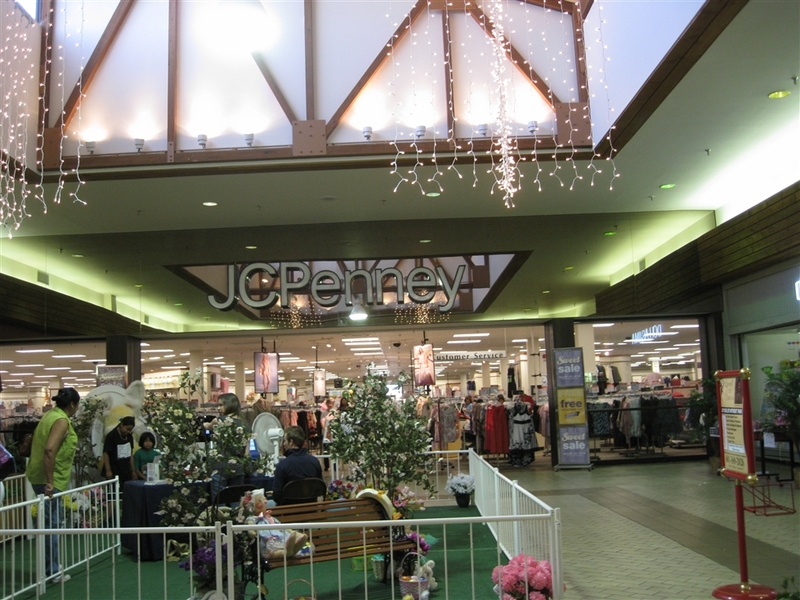 I go to Sawmill Square Mall quite often and am a former employee of the JC Penney Store that helps anchor the mall. The mall is VERY outdated, and does have A LOT of regional/local stores, but it is still some fun. Especially for the area. I did have the occasion of getting to speak with the mayor about our outdated mall. According to him (Melvin Mack), the city has been working to help expand the mall and get more national chain stores. The problem is that most national stores look at the population of the city, and they do not take into account the size of the county, that looks at Laurel/Sawmill Square Mall as its shopping center. Laurel has the opportunity to have a GREAT mall, IF these stores would consider this fact. The mall did get a Rue21 that will open Feb. 26, 2009. Hopefully this will be the beginning of many more great stores. I know the assistant manager that was hired and according to him, the company is expecting the Sawmill Square Mall Rue21 to bring in two times more income that the one in Hattiesburg, MS next to Turtle Creek Mall. Mall opened in 1981. I was 9 years old and my Mom worked at the bookstore. Waldenbooks orginal store closed last week and Sound Shop is closing next week, also a mall orginal. I don’t remember a Record Bar- it has always been Sound Shop. Taco Place was orginally Taco Casa until about 12 years ago. Karmelkorn was changed to Popcorn place maybe 15 years ago. I am very interested in Laurel Ms.because my mother was born there in 1919. She was raised in Chicago but I must visit there because it seems to be my real beginning. I know that I must visit Laurel before I leave this earth. I would like to see the barn that she was born in but,of course I know that would not happen, I know that I will be there. Some news on Sawmill Square Mall. They snagged national retailer The Children’s Place along with an eatery called Catfish One. But recently lost a clothing retailer that has been there since the mall opened, as well as Waldenbooks & Sound Shop. Children’s Place in a mall this small and isolated? Wow. That’d be like opening a Gap at Alpena Mall. I grew up in Laurel, MS and I remember this mall very fondly from my youth. I had a job at the Faye’s Hallmark shop that was just across from the Chik-fil-A. I think the Catfish Restaurant is where the Swenson’s Ice cream shop used to be when the mall opened originally. I agree with the other post. The mall was built new so none of the original sawmill was used but that would have been a neat idea. However, we thought it was pretty special at that time. I’m glad that it is still surviving through these economic times. I would like to see it revived because it was such an important part of the town. Sawmill Square Mall opened in the summer of 1981. I worked in the Sears across the street from the mall that summer and remember very vividly how excited we were to actually have a mall in our small town and it had a Chick Fil A in it to boot! Cowboy Maloney’s Super Store is in what used to be Super-X drug store. 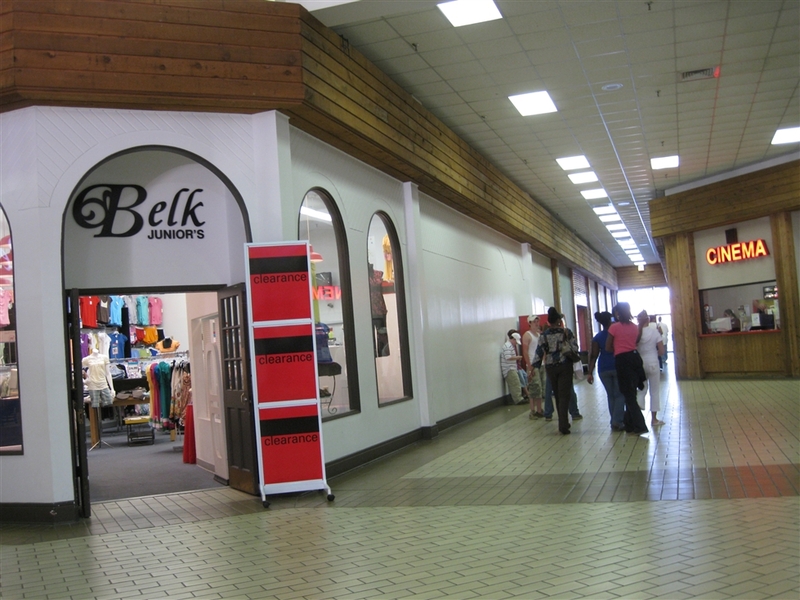 The Belk Juniors started out as Small World (a children’s clothing store) local to Laurel. Small World also had a location in North Laurel Shopping Center. There is an empty store across from Belk Juniors that was Calagaz Photo when the mall originally opened. There was also a Kinney Shoe Store, Mel-Macs (another local Laurel store), Foxmoors Juniors and Lerners. Swensens Ice Cream Parlor was indeed where Catfish One is now and across from that was A&G Cafeteria. Next to Penney’s is now a Dollar Tree or something along those lines. That store was originally World Bazaar, which is kinda like a cheap Pier 1 import type store. The Sawmill Square Cinema 5 is still the movie theater but across from that (and now gone) was Aladdin’s Castle arcade. I cannot tell you how many quarters I spent playing Ms Pac-Man and Space Invaders. Oh, and there was also a Coach House gifts where Bath & Body works is today. The Cookie Company started out as The Great American Chocolate Chip Cookie Company (I know this because I worked there one summer) and there was also a Kay’s or Zale’s jewelers at center court in the mall. The Sound Shop (now Curves). I believe someone touched on The Hallmark Store and Waldenbooks (which closed this past December). i live in the heart of laurel,ms this mall is not “dead” i was just there yesterday but it is not that great anymore belk j.r. shut down but they did get rid of a local owned store and replace it with a rue 21 which was a good edition the store list is :jc penny,radio shack,cat fish 1,the taco place,NO FOOD COURT,belk,shoe dept.,foot locker,hibbit sports,the childrens place,chik-fil-la,the rest of it just is local owned. I would suggest just driving the extra thirty minutes to go too turtle creek mall in hattiesburg,ms it on turtle creek Dr. right off of hardee St. its much larger with food court indoor bungii jump hamster ball water fun(they zip you up in a ball filled with air throw they ball in the pool the ball floats and you just roll around it’s more fun than it sounds! BTW the pool is indoors:)also belk belk jr’s sears sears portrait studio jc penny hollister aeropostale A.E. E.B. games coffee house starbucks lots of vendors foot locker shoe dept. shoe show shoe carnival aside from the food court they have chuck E cheeses chillis garfields other stores are apple celluarsouth tmobile at&t verizon sprint eye mart express eye masters F.Y.E. as seen on T.V. classic cookie rue 21 plan 9 spencers old navy and aloooooooooottttttttt more stores than that so i think its worth the extra thirty minutes any questions email me :tadamagic@aol.com thx. Regarding your comment about The Children’s Place being in an isolated mall not being a good decision. This mall is not isolated. It is in a small town, yes, but people from the surrounding counties come to Laurel because that is what you do in rural MS. You have to drive 30-60 miles to shop at a Walmart or mall etc. And even though MS is a poor state, women really love to shop for babies….LOL!!! and The Children’s Place will do well. @Shawn S., Still. I’ve never seen it in a mall like this before. Usually it’s only in the very big city malls. How Can U get in touch with someone about the matter with the Mall Manager Bill Mcmulln?